CRMCA’s Governmental Affairs Committee works closely with members of the Colorado Stone, Sand & Gravel Association (CSSGA) in order to effectively manage the Association’s dual interests. CRMCA and CSSGA have also partnered with the Colorado Asphalt Pavement Association, American Concrete Pavement Association – CO/WY Chapter and the Colorado Contractors Association to form the Colorado Construction Industry Coalition (CIC-527). The groups primary focus is to influence the selection, nomination, election, appointment, or defeat of candidates to federal, state or local public office and to influence ballot measures. This Subcommittee is very active during the Legislative Session between January and May. During the session, the group typically meets every Monday morning at the Capitol with the CRMCA lobbying team and Subcommittee members. 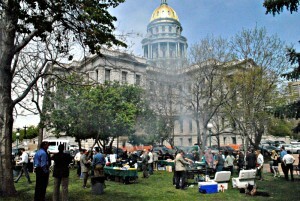 In addition, the Subcommittee helps to manage the Association’s Political Action Committee – the Colorado Concrete PAC. The Concrete PAC primarily focuses on donating to industry friendly political candidates at the state and local level. During the Colorado State Legislative Session regulatory representatives, legislative leaders, and members of the Governor’s administration are invited to visit with members of CRMCA and CSSGA. CRMCA along with the CSSGA recognize outstanding members for their participation in the political process.